What a pleasure it was supporting Carl, his son Matt and father Peter on a trip for three generations traveling to Italy together. They chose to stay in apartments for most of the two weeks to enable them to really experience the Italian culture. 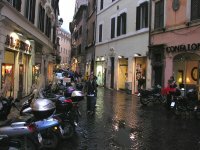 I found a great apartment in Rome near Campo dei Fiori for a week and in Amalfi for their second week. 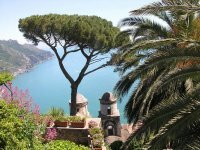 Both Carl and his father researched things they wanted to see and do and had a great balance of historical sights in Rome and hiking and relaxing along the Mediterranean. The found local bars for morning coffee, small grocery stores in the neighborhood, learned the local transportation and practiced using Italian to converse with the locals. One of their highlights was going to Capri and hiking up to the beautiful Villa Jovis ruins. On the way down a local resident invited them into his private gardens. They had the opportunity to not just visit Italy, but experience Italy. Brava! 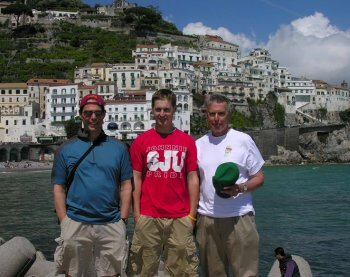 "Our father-son-grandson trip of a lifetime to Italy was flawless. With Ginger's coaching, we nailed down the logistics of travel, lodging (fabulous apartments!) and a couple of great guided tours. With that foundation in place, we could just concentrate on exploring and savoring the history, neighborhoods, people and FOOD in Rome and along the Amalfi Coast." "Apartment living in Italy is the way go. 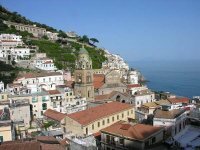 In both Rome and Amalfi, we became a part of the neighborhood and really got to experience the rhythm of local life. There's something transporting about smelling the neighbor's dinner cooking or hearing the guy next door singing after a couple glasses of wine in the evening. You don't get that close to everyday Italian life in a hotel." 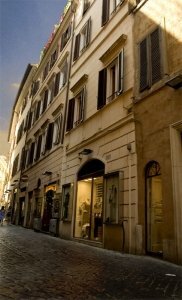 Historic Apartment Building in Campo dei Fiori neighborhood. Living room of 2 bedroom apartment. Sweeping view of the town of Amalfi and the sea from the Johnson's rooftop apartment. View from a day trip to lovely Ravello.